King Scallops with a Honey Glaze served on a bed of long grain rice. Defrost the Scallops overnight in a refrigerator or for 2-3 hours at room temperature. Dry the scallops using kitchen towel. Pan fry the dry Scallops in a hot pan or skillet with a little butter and olive oil. 2 mins each side - carefully turning to keep a golden appearance. Remove from the pan and keep in warm oven. Mix the Soy Sauce, Sweet Chilli Sauce, Honey and Mustard to a smooth consistency then pour into the same pan. Stir over heat for a minute or two until the sauce is of a thick syrup consistency. 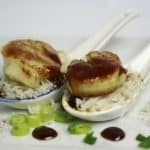 Serve the Scallops on a bed of rice, pour over the honey glaze and garnish with the chopped spring onions and paprika.